New studies are finding that your heart and brain health are directly connected to how well you care for your teeth. The concept isn’t new—year after year, researchers are finding more conclusive evidence that the state of your oral health is directly correlated to the health of your body overall. Skipping visits to the dentist for a professional teeth cleaning is quite common and a major contributor to disease, but even skipping your routine dental care at home can lead to a decline in health. If you don’t think daily brushing and flossing and routine teeth cleaning by a dental hygienist are important, check out these statistics— it’s almost a matter of life and death. A recent, large study found that individuals who have a professional teeth cleaning performed by dental hygienist at least once every six month were 24 percent less likely to have a heart attack than those who missed a visit each year. Even more astounding was the correlation between brain health and dental care—the same study found that making it to the dentist for that bi-annual exam and teeth cleaning can lower your risk of stroke by as much as 13 percent. Previous studies have found that skipping routine teeth cleaning appointments, as well as basic at-home dental care, can increase the risk of heart disease by as much as 70 percent. Overall, poor dental hygiene can raise the risk of heart and lung disease and diabetes, as well as impact cognitive health. Even with these additional research findings, scientists still are uncertain of exactly how and why there is such a significant link between dental health and total-body disease risk. The most popular hypothesis is inflammation. Tooth decay and gum disease significantly raise the level of inflammation in the body—a primary contributor to the development of disease. A professional teeth cleaning by a dental hygienist can remove bacteria and plaque build-up that a toothbrush and floss simply cannot reach. Cleaning your teeth regularly, both at home and at the dentist, gets rid of bacteria in the mouth that can contribute to chronic infection and inflammation that can ultimately spread to the rest of the body. The lowest risks of disease are associated with dental care habits that have been instilled in most people since childhood—brushing at least twice a day (preferably, after every meal) rinsing with a mouthwash, and flossing at least once a day. 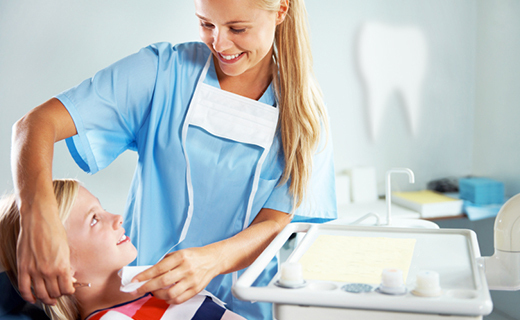 Visits to your dentist in Virginia should occur, at minimum twice per year; however, some individuals may require a more- frequent teeth cleaning regimen. Ask your dentist to help you determine the appropriate frequency for your teeth cleaning appointments to ensure that your smile and your health remain optimal.